“Learn the business before you do the business.” Those words from a mentor gave David Schwartz all the motivation he needed to build his real estate career from the ground up. David’s first taste of the real estate industry was through an internship at AMLI, during his senior year at the University of Illinois. Following graduation, David earned his real estate license and became a full-time employee in AMLI’s brokerage division. As a tenant broker at AMLI, David persevered through long days and regular rejection while making cold calls and wearing out business shoes by walking through the city looking for prospects and building business relationships. Following his eventual success as a broker at AMLI, David found his true calling as a multifamily acquisition associate, working for his eventual partner, Pete Vilimin. 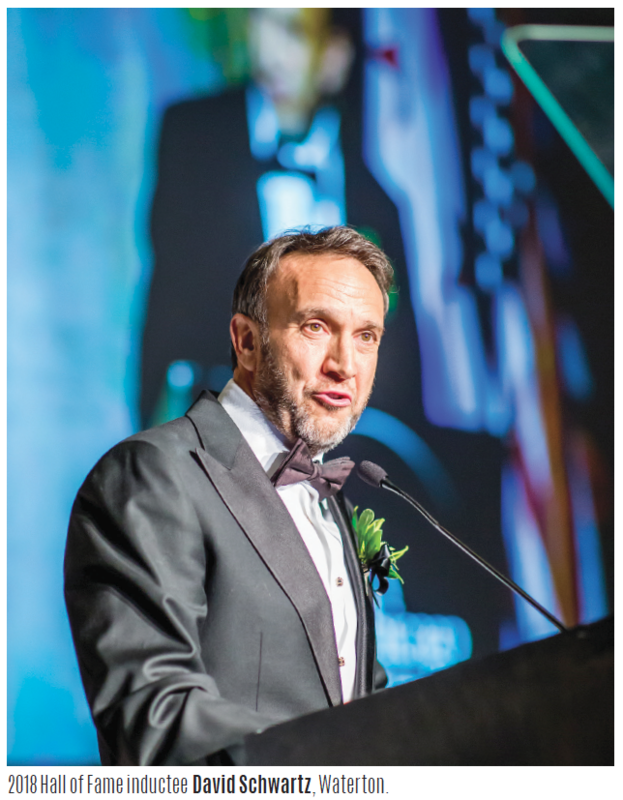 In 1990, he earned his MBA from The University of Chicago Booth School of Business and subsequently accepted a position at Equity Group Investments, where he quickly became the Vice President of Acquisitions for Equity Residential Properties Trust. In 1995, David reconnected with his former boss Pete, and the two co-founded Waterton. Today, David serves as the company’s CEO and Chairman, responsible for the business activities, operations, and strategic decisions. Waterton has significant real estate holdings across the country, including notable Chicago properties Presidential Towers, North Harbor Tower, The Montrose and River North Park. David’s belief in the importance of a “culture of nice” and “getting it done” sets him and his firm apart. In addition to his standout career, David is a member of the executive committee, a senior officer and vice chairman of the National Multi Housing Council. He is a member of the Urban Land Institute and is chairman of the ULI Multifamily Blue Council. David is also a member of the Pension Real Estate Association and a member of the Advisory Council for the Pritzker School of Medicine and the Department of Biological Sciences at the University of Chicago. Further, David has chaired fundraising efforts for the Jewish Federation of Chicago and he is on the Strategic Advisory Council for the US Holocaust Memorial Museum. In his career and community involvement, David led with humility, compassion, integrity and commitment. David’s peers, clients, and mentors Greg Mutz, Sam Zell and Penny Pritzker can attest to his reputation of working hard and doing the right thing. 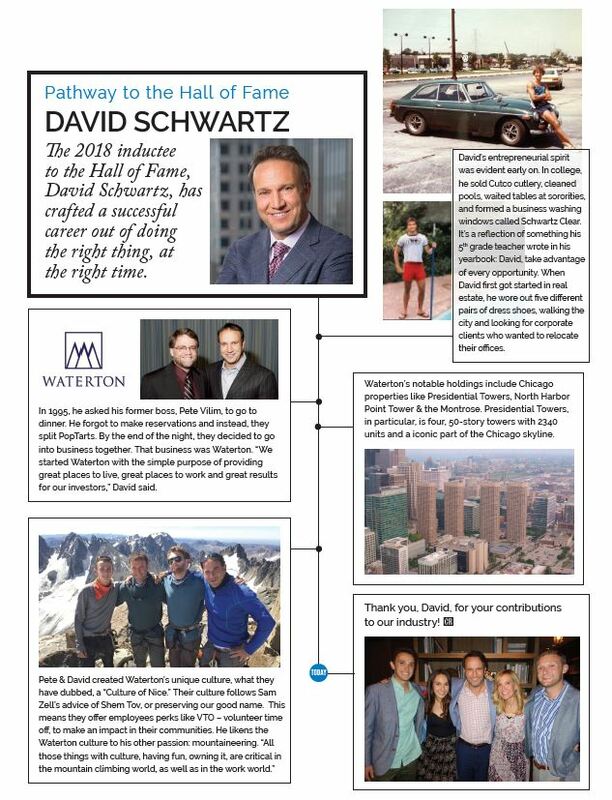 For all the reasons above, David Schwartz was honored as the 2018 Chicago Association of REALTORS® (C.A.R.) Hall of Fame Inductee. Congratulations, David!